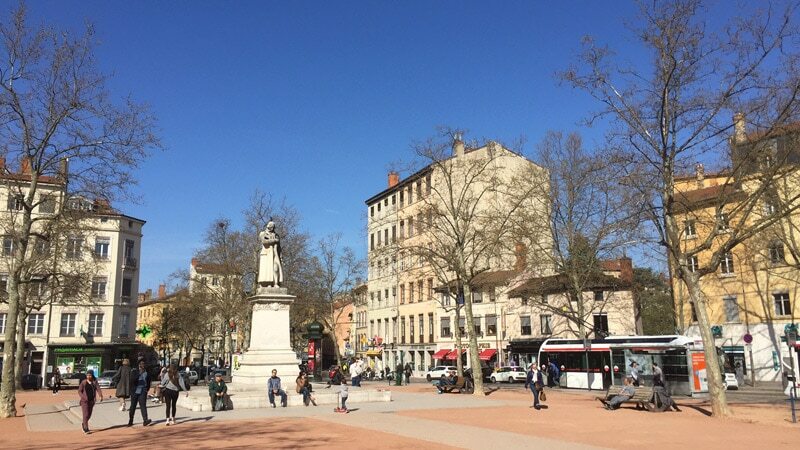 In the north of Lyon, the 4th arrondissement is a residential area at the top of the Croix-Rousse hill between the Rhône and the Saône that has stayed true to its village roots. The Place de la Croix-Rousse is the main square of the 4th arrondissement’s plateau. The 4th arrondissement is one of the nine arrondissements that make up the city of Lyon. Located in the north of the city, it was created in 1852 around the borders of the former town of Croix-Rousse. Bordered by the Rhône and the Saône, the plateau of Croix-Rousse is a large and lively residential neighborhood made up of 37,000 inhabitants. 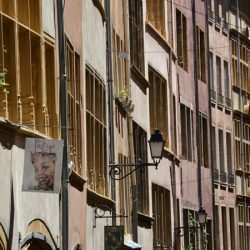 The eastern part of the quarter, near the Rhône, is home to traditional apartments from the time of the canuts, or the silk workers of Lyon. With space for playing the Lyonnais “boules,” its popular market, famous carnival (la vogue aux marrons), and plenty of bistros and businesses, the 4th arrondissement has the atmosphere of a village just above the bustling city center. Some residents even identify more as “Croix-Roussiens” than they do Lyonnais. The 4th arrondissement of Lyon is located in the north of the city, between the 1st arrondissement and the town of Caluire-et-Cuire. To the east and the west, it is bordered by the two rivers that run through Lyon, the Rhône and the Saône. Stretching over 293 hectares, the 4th arrondissement is mostly made up of the Croix-Rousse plateau, at an altitude of 250 meters. The 4th arrondissement sits above the hustle and bustle of Lyon, with stunning views to the east on clear days. The 4th arrondissement is served by two stops on the metro line C: Croix-Rousse and Hénon. There are also many bus lines that run up to the district: trolley buses C13 and C18, the shorter lines S6 and S4, and lines 2, 33, and 45. By car, the plateau can be reached by the Rue Terme tunnel that goes underneath the slope of the hill. Built in 1862, this tunnel housed the first metro in the world until its closure in 1967 and transformation into a road. The main axes of the quarter are the Boulevard de la Croix-Rousse and the Grande Rue de la Croix-Rousse. The boulevard separates the 1st and 4th arrondissements along the city’s former ramparts, while the Grande Rue links the arrondissement from north to south. The town of Croix-Rousse was a suburb of Lyon located outside the ramparts, until it was incorporated into the city in 1852. From ancient times to the Middle Ages, the Croix-Rousse plateau, also called the Saint-Sébastien mountain, was dedicated to wine culture. In 1512, King Louis XII built the ramparts and the plateau officially became a city suburb. It was during this same time that a pink-orange stone Couzon cross was erected, giving the neighborhood its name. 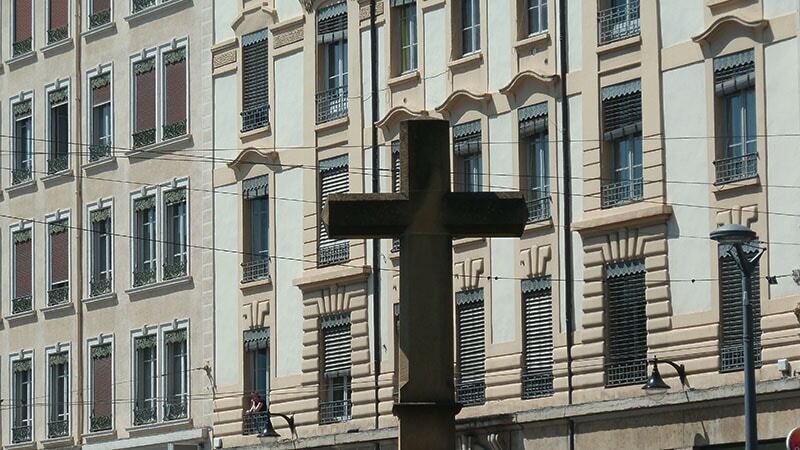 The cross was destroyed and moved many times over the years but has been located at the Joannès Ambre square since 1994. Croix-Rousse is named for the pink-orange cross that now sits in Place Joannès Ambre. The surrounding wall was destroyed during the French Revolution and rebuilt in 1834. It was permanently demolished during the 1860s to allow for the Boulevard de la Croix-Rousse. Today two forts remain from the original barricade, the Saint-Jean fort on the Saône side and the Saint-Laurent fort on the Rhône side. The 4th arrondissement experienced a lot of development in the 19th century with the arrival of the silk workers, the canuts. The entire eastern part of the quarter was constructed with buildings made for Jacquard silk machines, and the neighborhood was the site of the first strikes and worker’s revolts during the introduction of these machines. The area also grew thanks to its incorporation into Lyon, with the construction of the Croix-Rousse hospital which is still in use. 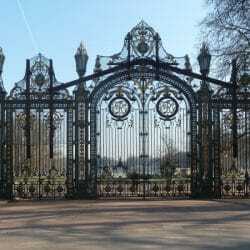 The 4th arrondissement doesn’t include many of the big historical monuments and roman ruins that make up Lyon, but there are still plenty of things to see and do. The “Gros Caillou” was carried from the Alps by glaciers about 140,000 years ago and was found during the construction of the Rue Terme tunnel in 1861. 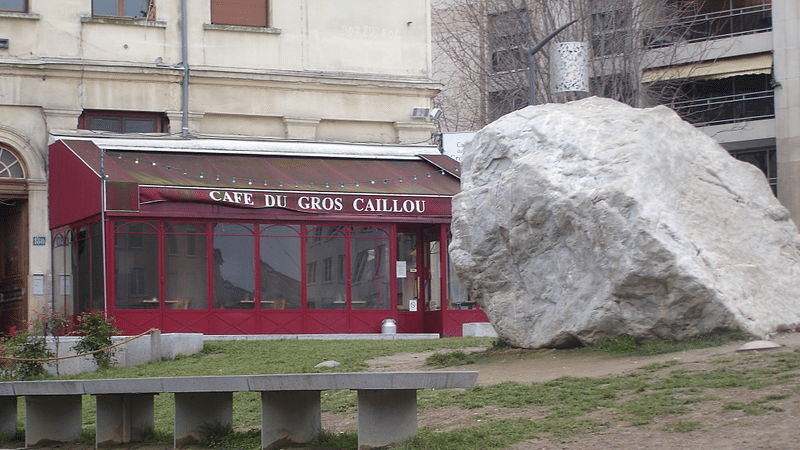 Le Gros Caillou: This massive stone was carried from the Alps by glaciers about 140,000 years ago and was found during the construction of the Rue Terme tunnel in 1861. It was then moved to the eastern edge of the Boulevard de la Croix-Rousse. It is one of the symbols of the neighbourhood and also the “oldest monument of Lyon.” However, during the creation of an underground parking lot the “pebble” was moved a few meters, and is now technically part of the 1st arrondissement. L’esplanade du Gros Caillou, created in 2008, offers beautiful views of the eastern part of Lyon. On clear days you can even see the Alpes and Mont Blanc. Le Jardin Rosa Mir: A secret courtyard near the Croix-Rousse hospital. The Théâtre de la Croix-Rousse is a classic spot to visit in the arrondissement. 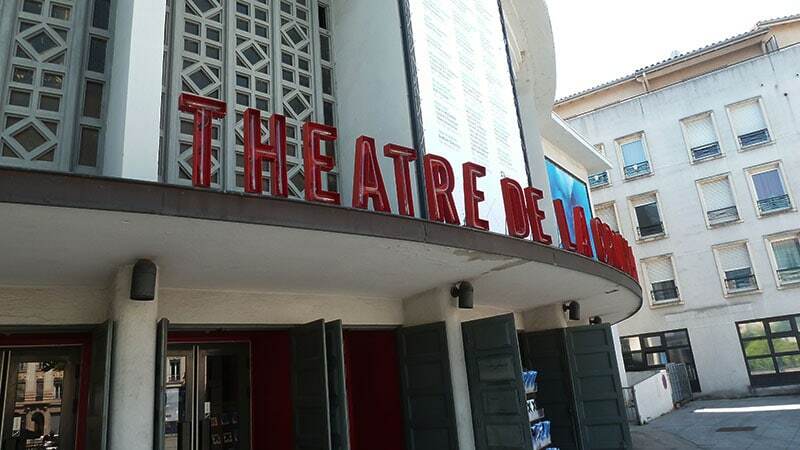 Le Théâtre de la Croix-Rousse: built at the end of the 1920s. Cinéma Cifa: a 1950s-style theater run by an association. Villa Gillet: located at the heart of the Parc de la Cerisaie, this is the former house of the Gillet family, a rich industrial family specialized in clothing dyeing. Built in 1912, the Villa Gillet today functions as a cultural institution that organizes the Assises Internationale du Roman. 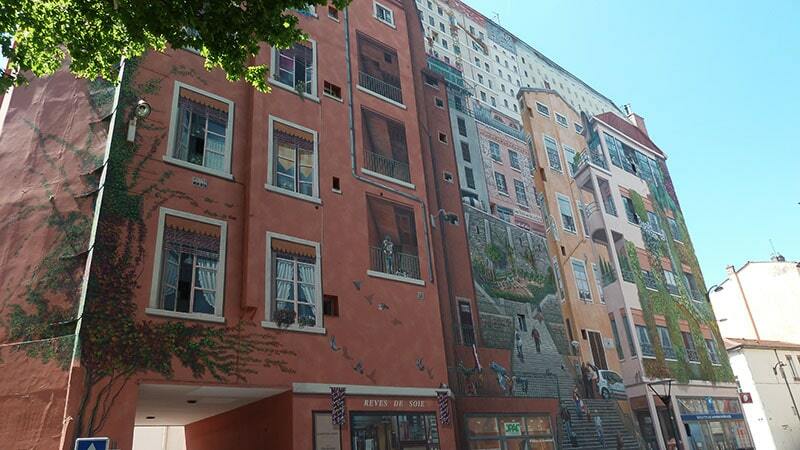 Mur des Canuts: this large mural is one of the biggest “trompes l’oeil” in Europe. In 1987 the artists from CitéCréation painted these 1200 square meters of a building on the Boulevard des Canuts. Every year in October and November, the Boulevard de la Croix-Rousse hosts “La Vogue aux Marrons,” one of the last urban carnivals in existence. The carousels attract over 500,000 people each year. The Croix-Rousse Market: one of the oldest and biggest markets in Lyon. It always gets very crowded on Saturday and Sunday towards the end of the morning. In spring and autumn, the plateau holds many flea markets and car boot sales. 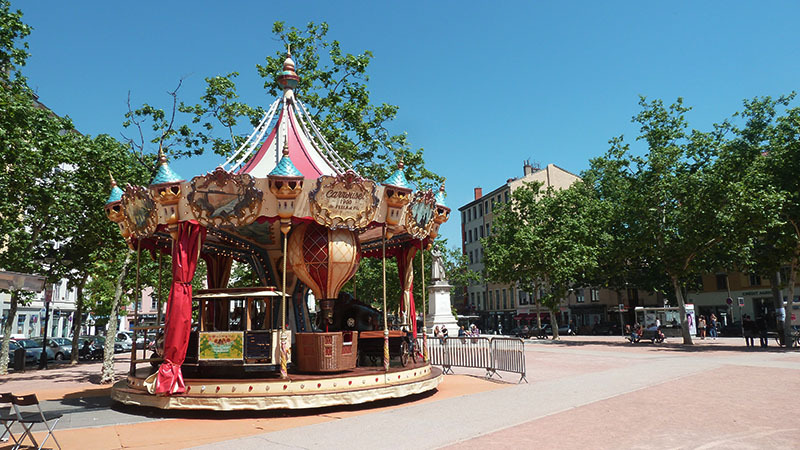 The carousel at Place de la Croix-Rousse is always a big attraction during festival periods. 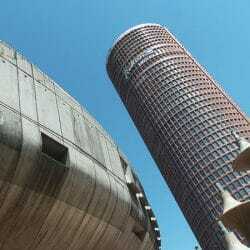 The Maison des Canuts offers a way to discover weaving looms and the world of the canuts. The Parc de la Cerisaie and the Parc Chazière offer great places to relax, as the two main green spaces in the neighborhood, located to the west by the Saône. Eat and Drink: the best restaurants can be found on Rue de Belfort, Rue Pailleron, Rue du Mail, around the 4th arrondissement city hall, and at Place Tabareau. There are also plenty of bars with outdoor seating all along the boulevard and in the Croix-Rousse square. The 4th arrondissement has a reputation as a good place to live. It’s safe but with a population that is still mixed, and lots of businesses and schools. It is close to the center of town but also nicely separated from the activity of the Presqu’île. Prices start around €4300/m2 when looking to buy. It has become one of the most expensive areas in Lyon because of its high demand and high quality of life. Apartments with views of the Alpes and the Massif Central are especially coveted. Quartier Serin: located on the bank of the Saône and near the Croix-Rousse tunnel, this neighborhood offers recent construction with a view of the river that is still affordable. There are still some houses in the neighborhood around the Croix-Rousse cemetery, on the east side. The neighborhood of the Gros Caillou and Place de la Croix-Rousse is in extremely high demand and therefore very expensive. The area around the hospital is a bit less central and more affordable. The historic heritage of the city from “Vieux Lyon” to Fourvière. Lyon’s bourgeois residential area near Parc de la Tête d’Or.